Thanksgiving, and the processing and distribution of turkeys, is a busy time for us. We are beat by the time Thanksgiving is upon us and do our best to take a couple of days and relax. Of course a day or two of relaxing is easier said than done. There are still small amounts of vegetables that need to be picked. Mostly things that were not quite ready at the end of the season, or were missed and only discovered when plant removal occurred. 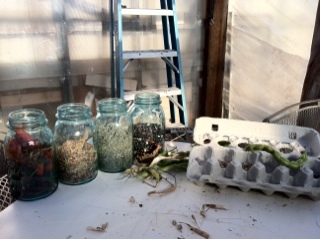 Peppers, asparagus seeds, dried sage and black beans are in these jars. We used the sage on top of our turkey when it was roasting. The few peppers will dry up and we will use both seed and skin. The asparagus seeds will be planted. And the black beans will go into a pot on a cold winter day and be combined with the peppers and sage to make a meal!